Danielle Williams, the founder of Dream Keepers and CEO of Dream Keepers, believes that “Happy Girls are Prettier" and has made it her life’s mission to help those in her sphere of influence to find their positivity, happiness, and inner beauty. To that end, Dream Keepers has developed the Dream Girls program! 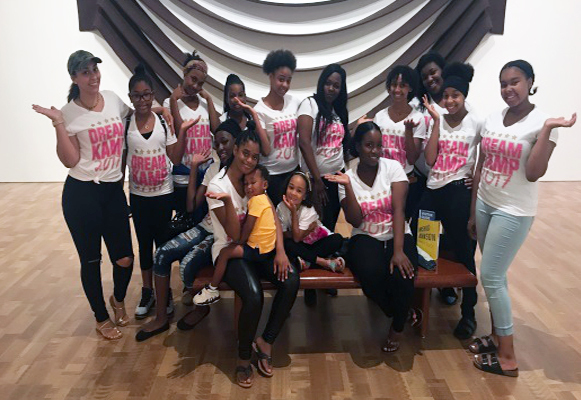 The Dream Girls program is designed to provide leadership development and peer mentoring, in a safe place to learn and grow, for girls, ages 12-18. Dream Keepers’ goal is to empower the leaders of this generation to inspire, motivate and lead others. The Dream Girls program is all about empowering girls to make a difference in not only their lives, but also the lives of others. The program teaches girls to lead, accomplish their goals, follow their dreams; as well as encourage and empower other girls to achieve the same. Dream Keepers’ Dream Girls come to get inspired, then leave with practical advice and tools to make their dreams a reality. This program builds the girl’s self-worth and confidence as they learn that beauty really does come from within. Our Dream Girls are introduced to expert professionals in various disciplines and businesses. Field trips or outings may be scheduled throughout the program if permitted. In addition, each girl will enjoy Glam Sessions that consist of spa quality tutorials for hair, skin, and nails, skill-building workshops, college and financial aid tutorial and community volunteering opportunities. The program ends with a Celebratory Event, that the girls create, and an Award Ceremony. Each girl who successfully completes the program receives a Dream Keepers Certificate and gift bag. This program can be customized to meet your specific needs. Group Programming Available (GROUP SIZE OF 20). Yes! We want the Dream Girls Program! Register your Company or organization and provide the Dream Girls program to a group of Girls.